If you are wondering when is the right time to floss, let me tell you, whenever you can find time to floss, make sure you do! Similar goes for brushing your teeth – if you can find the time to brush your teeth, make sure you do so. However, you should also pay attention to brushing technique, as aggressive brushing can also be damaging on your teeth and damage your teeth enamel. In addition to that, here are four situations in which you can also floss, no matter where you are. The ideal time for flossing is when you are already brushing your teeth. Therefore, if you are already brushing your teeth you can make the time for flossing as well. In addition to that, the more frequently you floss, the less time you will have to floss and it will be easier to floss between your teeth. Also, I would recommend that you floss before you brush your teeth, so that you can remove any of the food that has been left with your toothbrush. If you brush your teeth before you floss, not only that you will not brush and clean your teeth properly, but you will also damage your toothbrush if you try to get out the food with it, rather than floss it out. Even if you are not at home but let’s say work, you can still floss after a meal. 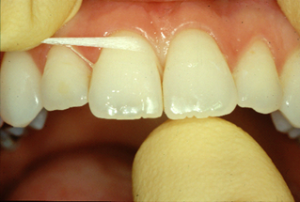 Floss can definitely fit in your bag, and it will make your teeth so much healthier. If you can just find a couple of moments to go to the toilet and floss, you will see that your teeth will be a lot prettier and healthier. In addition to that, it will prevent you going around with a piece of salad stuck in between your teeth, which can be rather embarrassing, especially if you have to continue your work day or have an important meeting. In addition to that, if you have the feeling that something is such in between your teeth, you should not wait a moment longer, but try to get it out with floss right away. In addition to the fact that it can be rather embarrassing, going around with food in between your teeth can actually have a negative impact on your dental health and affect your teeth in a bad way. The longer the food molecules are stuck to your teeth, the likelier it is that it will start damaging your teeth enamel and soon you may have to deal with caries and other dental issues. If you do start to experience any dental issues then you need to contact your local dentist. We have recommendation for dentists in Spartanburg SC. If during the day you cannot seem to find the time to floss, at least try to make some time for flossing later on in the evening before you go to bed. This will prevent you to go to bed with pieces of food in between your teeth, and as it has been previously mentioned, the longer the fragments of food are stuck to your teeth enamel the likelier it is that it will cause damage to your teeth and decay them pretty soon. Is Chewing Ice Bad for Your Teeth? Am I A Good Candidate for Invisalign Clear Braces? How Healthy Are You? Take the Quiz Now.